This beautiful beach is compromised by natural erosion. It happens every time sea level rises greater than 7 mm per year on average from all sources. 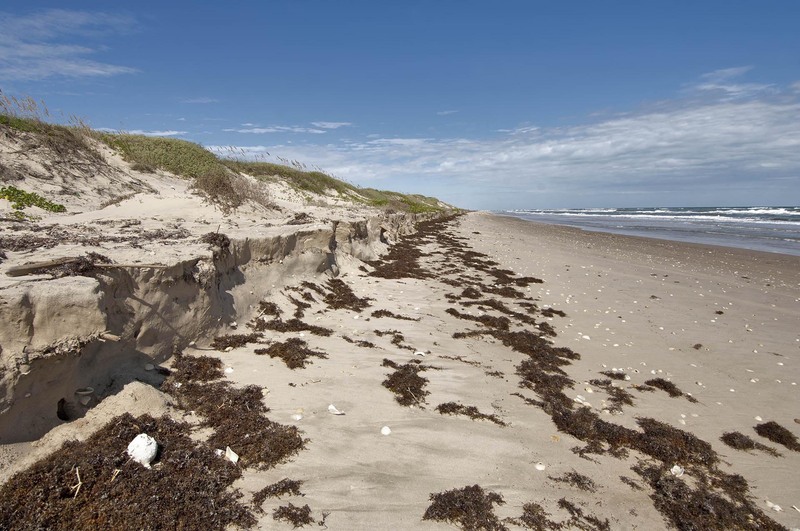 Here at mile 50 on Padre Island National Seashore, several factors have all added to sea level rise to cross the critical 7 mm per year barrier island disintegration threshold. The biggest of these is man-caused sea level rise. Stoknes 2015, What We Think About – When We Try Not To Think About – Global Warming; The New Psychology of Climate Action, has valuable insight into the solutions that are needed to overcome the culture of climate change bias that has evolved over the last 30 years. The problem is the confusion that voluminous literature has blamed on the media bias. Confusion creates fear, apathy, delay and denial. To overcome these behaviors, Stoknes says don’t scare people. In a profound example he cites Martin Luther King’s famous “I have a dream” speech. In this speech, Dr. King did not say, “I have a nightmare.” We need to frame our climate discussions differently than we have for the last 30 years. Make the discussion social. Climate change is everywhere in our society already. What appear to be small or even irrelevant impacts are most decisively not, once their full extent is known. Stoknes says to make the discussion about how our society can achieve a low carbon destiny with a witty analogy: the stone age didn’t end because of a lack of stones, why should the fossil fuel era not end when plenty of fossil fuels remain? Another important technique is to tell stories to impart a personal connection. Stories about how the science is actually done, who it is that is doing it and their personal challenges, and even non-science stories that can link back to climate change related things are all important. They temper that harsh facts. The reason is because they use a different part of the brain to get the message across. Our left brain has been bombarded for a generation with frightening facts and figures. We need a fresh approach. Seeing climate change with our own eyes is key. We need to experience these things for them to be real in our minds. Their scale and scope is simply something that is not a part of our civilization’s memory. There is no history of how to behave. The consequences of climate change have never happened to us before. It is the unknowns that challenge our brains. Climate science is a left brain thing. But because we don’t have historical metrics on how to evaluate climate change, outreach that uses the left side of the brain can confuse the issue even more, leading to greater apathy and delay. This is why the right side of the brain and emotions, intuition, and creative expression are so important. They can bypass the logical function of the left side of the brain that is now confused because it cannot find a relationship between climate change behavior and anything we have ever done before. Our filmwork focuses on music and beauty because these are right side of the brain things. It is more likely that this kind of outreach will not carry on with failures of past left brain based outreach. Our films like to concentrate on the blues. The blues are all bad, right? But we enjoy the blues as music. The climate connection is obvious, why haven’t we done this before? The beauty? Climate impacts are not inherently bad. They happen every time our climate changes and are very natural. A mountain range covered by red (dead) conifers is no less beautiful than a mountain range covered by red autumn leaves of deciduous trees. Perplexing yes, but beautiful still. Our best outreach technique however, could be our T-shirts. Because it is increased familiarity with the general topic of climate change that we need, simple firing of neurons adds experience in our brains. As long as these experiences are not frightening, they help increase our ability for rational thought. The polar bear is an icon that has become widely identifiable with climate change over the last 30 years. Just the simple observation of a polar bear then, creates a pathway in our brains to subconscious thought about climate change. It is this increased awareness that allows logical thought to proceed. The more we think about it in a nonviolent sort of way, the greater capacity of logical thought we obtain. One last elementary thought about global warming psychology involves a healthy climate. What we have been drummed into thinking is a “healthy climate” is in reality, a climate on the verge of dangerous. At least this was the definition in 1990 when the climate science consensus decided that 2 C of warming was the threshold to dangerous climate change. Because of the great delay in action, dangerous climate change is now about 1 C of warming, or the amount of global warming we have seen already. The consensus is attempting to move to 1.5 C, but the consensus as stated previously, understates. Fundamentally then, for nearly thirty years it has been our quest to achieve a climate that is borderline dangerous; or now, beyond dangerous. By any other definition, just borderline dangerous is decisively not healthy. The Healthy Climate Alliance has brought a fundamental piece of global warming psychology into the light that embodies the principles of this new psychology. Why are we not asking for a healthy climate instead of one that is dangerous?